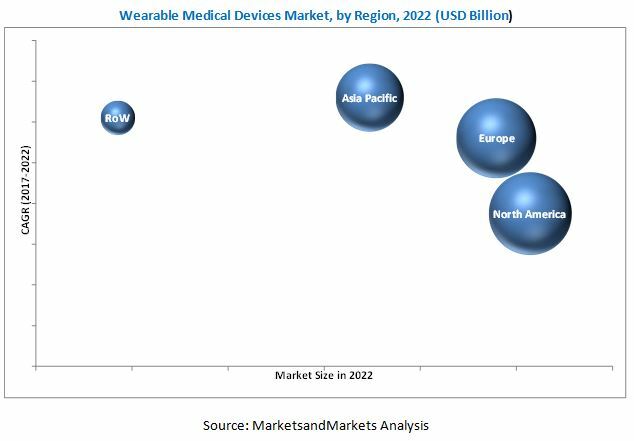 [161 Pages Report] The wearable medical devices market is expected to reach USD 14.41 Billion by 2022 from USD 5.31 Billion in 2016, at a CAGR of 18.3% during the forecast period. The base year considered for the study is 2016 and the forecast period is from 2017 to 2022. To define, describe, segment, and forecast the global market on the basis of type, distribution channel, application, device type, and region. The study estimates the wearable medical devices market size for 2017 and projects its demand till 2022. In the primary research process, various sources from both demand side and supply side were interviewed to obtain qualitative and quantitative information for the report. 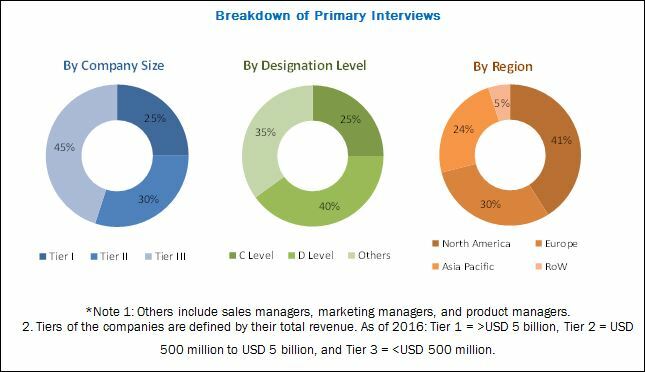 Primary sources from the demand side include various industry CEOs, vice presidents, marketing directors, technology and innovation directors, and related key executives from the various players in the global market. For the market estimation process, both top-down and bottom-up approaches were used to estimate and validate the market size of the wearable medical devices market as well as to estimate the market size of various other dependent submarkets. All possible parameters that affect the market covered in this research study have been accounted for, viewed in extensive detail, verified through primary research, and analyzed to get the final quantitative and qualitative data. This data was consolidated and added to detailed inputs and analysis from MarketsandMarkets and presented in this report. The wearable medical devices market is highly competitive with the presence of various players. Some of the major players operating in the market are Fitbit (US), Philips (Netherlands), LifeWatch (Switzerland), Garmin (Switzerland), and Omron (Japan). The other players operating in this market include Drägerwerk (Germany), Nokia Technologies (US), Jawbone (US), Polar (Finland), Wor(l)d Global Network (US), Activeinsights (UK), VitalConnect (US), Xiaomi (China), Misfit (US), and Monica Healthcare (UK). The wearable medical devices market is expected to reach USD 14.41 Billion by 2022 from USD 6.22 Billion in 2017, at a CAGR of 18.3% during the forecast period. Factors such as technological advances in medical devices, increasing penetration of smartphones and growing number of smartphone-based healthcare apps compatible with wearable devices, growing preference for wireless connectivity among healthcare providers, and increasing awareness about physical fitness are driving the growth of this market. The report segments the global wearable medical devices market into type, application, device type, distribution channel, and region. Based on type, the market is further classified into smartwatches, patches, smart clothing, and activity monitors. The activity monitors segment is expected to grow at the highest CAGR with largest market share during the forecast period. This growth is mainly due to the high prevalence of lifestyle diseases, growing adoption of sedentary and unhealthy lifestyles, and increasing awareness of fitness and health. The global wearable medical devices market, by applications, is segmented into sports and fitness, remote patient monitoring, and home healthcare. The sports and fitness segment is estimated to account for the largest market share in 2017. The growth of this segment can be attributed to the increasing focus on physical fitness among people to improve the quality of life, coupled with the growing trend of tracking health progress. Based on distribution channel, the wearable medical devices market is segmented into pharmacies, online channel, and hypermarkets. In 2017, the pharmacies segment is expected to account for the largest share of the market. The growth of this segment is mainly attributed to factors such as increasing trend towards self-monitoring and non-invasive monitoring & diagnosis and substantial increase in the supply of wearable devices in pharmacies. The market is dominated by North America, followed by Europe, Asia Pacific, and the Rest of the World (RoW). The dominance of the North American market is attributed to factors such as the presence of developed healthcare infrastructure, focus on technological advancements, and the development of interconnected and highly advanced healthcare apps and compatible devices. While the wearable medical devices market represents significant growth opportunities, market growth may be hindered due to the high cost of wearable devices, lack of reimbursement, and data security issues. Fitbit (US), Philips (Netherlands), LifeWatch (Switzerland), Garmin (Switzerland), and Omron (Japan). The other players operating in this market include Drägerwerk (Germany), Nokia Technologies (US), Jawbone (US), Polar (Finland), Wor(l)d Global Network (US), Activeinsights (UK), VitalConnect (US), Xiaomi (China), Misfit (US), and Monica Healthcare (UK).